Many tabletop games are easy to categorise. “This one’s a deck-builder where you’re claiming and eliminating/banking cards from your deck in order to maximise your available actions and, ultimately, haul of victory points”, “This one’s an auction game where you’re bidding against others for resources based on a fluctuating market”, “This one’s a social deduction game where you’re trying to suss out who’s a werewolf/mafioso/spy/werewolf-mafia spy,” etc. Many successful games combine a few of these elements or expand on and refine the basic concepts in remarkably clever ways. A Study In Emerald cares not for such restraint. It wants as much as will fit and thrives on the resulting chaos. It is a game with elements of deck-building, hand management, bidding, area control, hidden roles and even a touch of press-your-luck (or press-your-sanity) that all combine to form a refreshingly innovative game that never plays the same way twice. It is a wonderful mesh (and mess) of both board and card game mechanics. The whole package is so fiendishly clever that I must admit I’m finding it odd to see myself raving about classifications and game mechanics before even getting to the theme itself. So I shall talk about the theme itself. Firstly, in the same way video game fans probably groan every time they see a new game with zombies, board game enthusiasts probably share that reaction with regard to both zombies and Lovecraft. 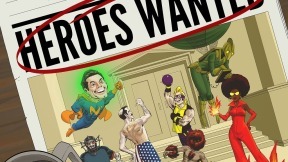 Going by popular genre theory, when a genre matures past a certain point, the parody emerges and it’s hard not to regard every new release with increased scrutiny and awareness of tropes. 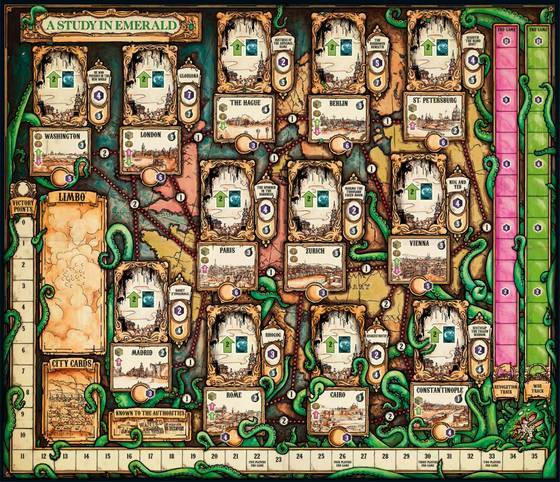 A few years back, video games had its “I Made a Game with Zombies in It!”, while board games recently had its Smash-Up expansion, “Obligatory Cthulhu Set” (which received a lukewarm reception itself). While neither might be their medium’s first, both are the most obvious examples. That’s not to say there isn’t great work still being produced that utilises these elements. 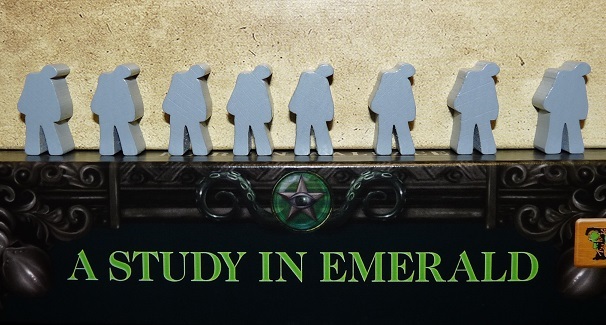 Case in point: A Study In Emerald. A smart, innovative take on the mythos of its shared properties and ideas. Its title and part of its premise comes from Neil Gaiman’s short story in which the world of Sherlock Holmes and H.P. Lovecraft collide with a neat twist on the detective’s original 1887 outing “A Study in Scarlet”. This has then been expanded into a ‘secret war’ setting inspired by a history book – “The World That Never Was – a true story of dreamers, schemers, anarchists & secret agents” – that the designer read but couldn’t quite see working as a setting on its own. Replace the Victorian-era royalty with Eldritch horrors and make the secret conflict between two factions — Loyalists looking to maintain the status quo and Restorationists aiming to overthrow the monstrous overlords — and you have a much more palatable game. 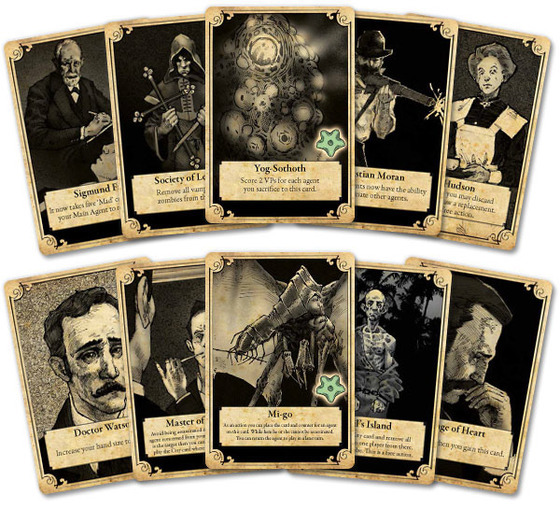 Mix in real historical figures, Sherlock Holmes characters, creatures from Lovecraft lore, as well as vampires and zombies and you have a delightfully bizarre ‘alternative history’ game world. Yep, this game has zombies too. Trust me, though, you’ll love these guys. Of course, a great premise and theme is fine and dandy, but it’s all for naught unless it gels with the mechanics. Fortunately, the overall implementation shines. Players build up their network/resources, vie for control of cities, assassinate or protect public figures, off each other’s agents and pursue other dastardly methods of coming out on top whilst attempting to mask their true intentions and motives. How it all ties together is actually very simple, and at its core, the game is about having the most victory points when the game ends. …Except that’s also nowhere near as simple as it sounds. To elaborate, I’ll explain a little of the basic gameplay. 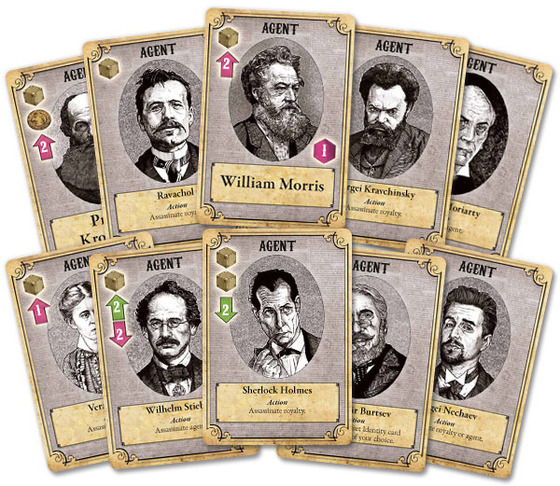 Each player will take control of a ‘Main Agent’ — from a choice of five, codenamed Monday through Friday, each with their own identifying colour — and a deck of ten starter cards. These are all identical, so everyone starts on a somewhat level-footing. On the cards are various icons and abilities, which govern what actions a player can take on their turn. The actions they can perform with the cards play out on the board itself, where they will be controlling their agents and claiming more cards and even cities. Weekends are for the weak. Across this board are twelve cities, from Berlin to Zurich… wait, those two aren’t far apart, relatively-speaking, and this already sounds too much like Power Grid. This is very much not Power Grid. The board represents the battlefield on which your secret war takes place (that’s more like it). Across it are twelve main spaces representing major cities of the era; most of them European, but also including Washington, St. Petersburg, Cairo and Constantinople (“Only 1800s kids will remember this”). Each city contains a randomly-dealt stack of 3-4 cards that players can claim and add to their deck, ranging from those that award extra agents with various icons and abilities through to unique special power cards. 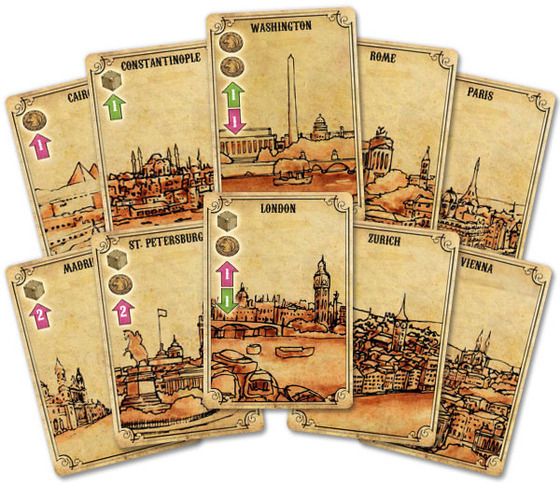 Alternatively, players can claim the cities themselves, earning points and that city’s card with its own special icons. And players will want these extra actions and icons to open up more options or increase the effectiveness of their existing ones. Fortunately, the icons serve multiple functions, so there’s already a decent amount of approaches available from the starting cards. Cube icons allow players to place or retrieve that many influence cubes, which are used to bid for and claim cards/cities. The coin icons can be used to add more influence cubes to a player’s available stock (which begins at 6) or allow players to pay to move their agent(s) around the board — handy for supplementing and breaking ties in bids or for assassinating royalty/agents. 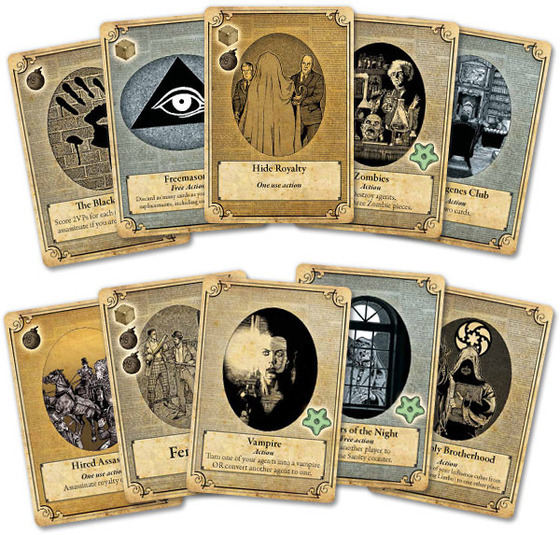 Bomb icons are used when assassinating/hiding, and some cards have text that allow special actions, which can be an array of things from initiating an assassination itself to spreading a zombie apocalypse or having Cthulhu completely destroy a city. Some cards will feature multiple icons or a combination of text and icons, but a player can only use a card for one type of icon or the action before it goes into their discard pile until a reshuffle or, in the case of ‘One Use Actions’, from the game completely. Since the hand size is only five cards and players are limited to two actions per turn, they will have to consider how best to utilise their hand, and it behooves them to learn what they have cycling in their deck. The real meat of the game comes into how players wage this secret war on all fronts. Typically, the game will start in a somewhat reserved manner, with the only real conflict coming from the bidding wars over cards and cities, but soon enough, as players add two or three more cards to their deck, that wealth of options opens up. Because each card is able to tip the balance in subtle ways or somewhat powerful in its own right, certain strategies and approaches will form in the player’s mind. They might find a quicker way to grow their pool of influence cubes, making them a bidding powerhouse or they might nab a Nadar (it’s a blimp) that allows them to move agents around the board more easily, perhaps to pursue a ‘death from above’ strategy where the agent air drops in, assassinates someone and then flees to safety. And by the time all this is occurring, rivalries or suspicions will have emerged and the bolder plays start to dictate things. Royalty and agents will die, cities will swap hands back and forth, and supernatural entities might really shake things up. A lot of the game is about jostling for dominance, inching towards victory by clever use of your own built-up deck of cards and reacting to the actions of the other players. And you must react to the other players because of a large wrinkle in proceedings: hidden allegiances. See, going back to the theme, players will belong to one of two factions: the Restorationists, who seek to dethrone the Eldritch overlords, or Loyalists, who wish things to remain as they are. Red versus Blue? Pfft, Pink versus Green is where it’s at. The key thing to note here is that this is not a team game. The distribution of allegiances is not even a guaranteed balance. The game contains three of each allegiance, and these will be dealt out randomly, with the remainder going in the box. In other words, a two/three-player game could feature everyone with the same allegiance, or a 2/1 split in the latter case; a four player game could be 2/2 or 3/1 and a five-player game will always be 3/2 one way or the other. What distinguishes them is that each side has various additional, exclusive scoring opportunities. Restorationists tend to be focused on gathering a large network of agents and killing royalty, whereas Loyalists want to suppress the Restorationists while protecting the royalty and dabbling in the supernatural. What they share is a victory condition quirk whereby whoever is in last place when the game ends and all relevant score adjustments have been made, will disqualify everyone who shares the same allegiance. 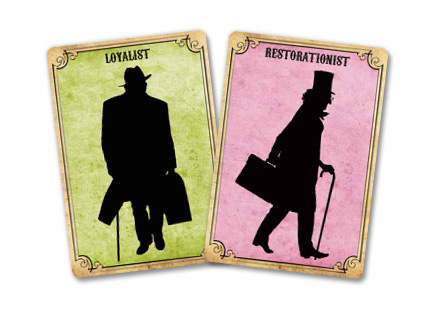 For example, even though a Loyalist managed to tear ahead on the score track and end the game, if another Loyalist is in last place or tied with a Restorationist (who win in ties) then the Loyalist side is eliminated and the victor is actually the highest scoring player on the Restorationist side. By that same virtue, on the occasions where only one player in the game belongs to a certain allegiance, that means they just have to best one other player of the opposite faction. So, what might seem like a 3 vs. 1 game does not play like that at all. It breeds this gloriously tense atmosphere where you’re constantly assessing and reassessing the other players’ moves, even making decisions on whether to help or hinder them when it looks like someone might tip the scales in their favour during the constant back-and-forth. During every turn, not just your own, there are lots of decisions to be made, thoughts occurring, plans forming. Do you try and rush to an early lead, grabbing cities in the hopes of clinging to at least some of those points as the game progresses or simply do it to pre-occupy the players while you work on another approach? Is it safe to let that other player waste energy pulling ahead because you have a strong suspicion that someone sharing their allegiance is in dead last? Should you go easier on that player because you fear they share your allegiance, and don’t want them to be last? Can you do it with being too obvious? Are you absolutely sure of that player’s allegiance? It’s a difficult concept for new players to wrap their heads around at first, but it truly sets the game apart from others I’ve played and makes it more than just a race for victory points. To further cement that are the end-game conditions themselves. Going back to what I said about the core aim of the game, I purposely included the phrase ‘when the game ends’ because it can actually come about in a few different, player-led ways. This is not a game with a set number of rounds and phases. The closest to a ‘standard’ game end is a first-past-the-post victory point value that scales based on the number of players (and which I’ve not yet seen reached). Alternatively, the death/madness of a Restorationist’s Main Agent will end the game or, in special cases, a full-on zombie apocalypse will. Restorationists are free to kill another Restorationist’s Main Agent in order to secure victory or even send themselves mad at an opportune moment (consider it a “false flag” operation that incites a revolution?). I seized control of London and all I got was this lousy card. This all feeds into the constant tension over players tipping their hand too early. Claiming cities is a neutral, safe way to claim points, but there’s no guarantee that those are permanent. To really rack up the points, players will need to take bold, definitive actions and seek those asymmetrical scoring opportunities, which could reveal their allegiance. And I say ‘could’, because that’s where the real fun begins. Nearly all of the cards in the game are unique. Agents come in various forms, but will share a lot of the same basic actions or icons, but the more powerful, weird and wonderful cards are there for wreaking havoc, too. Some of these cards have clear advantages for one side over the other, sometimes offering bonus victory points only to a player of a certain allegiance, but because the game is so open-ended, many can serve multiple purposes. For example, that Zombies are a great boon to a Loyalist player is clear as day. 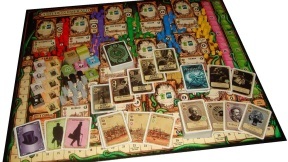 They award bonus points if all eight zombie pieces are on the board when the game ends (and as mentioned, can actually be used to cause a game end), plus the minions can each kill other agents in a single action, increasing the possibility of extra points if any belonged to Restorationists. However, while the point-scoring opportunities aren’t as obvious or directly related for the Restorationists, the constant threat they pose is useful when it comes to bidding and area control; forcing rival agents out of cities and, therefore, unable to contribute or break ties when it comes to claiming them and those all-important points. Additionally, players are forced to use up cards and actions in order to deal with the zombie hordes; moving agents to unoccupied cities to save them, or fighting back to clear key cities or stop the zombie commander fielding the full complement. Even agents, who might have a surface appearance as benefitting one side over another, can be handy purely as a buffer against assassination of a Main Agent (a Main Agent cannot be targeted if that player has other agents on the board) or for their usefulness in bidding/blocking claims. Using this knowledge, you can even try to deceive or suss out others. Place a cube or two down on a card that only helps or at least bestows a clear advantage to a particular allegiance, even if it isn’t yours, then see how the other players react. If a player bids for that card themselves, that might tell you they share that allegiance, whereas matching or simply blocking your effort could confirm they belong to the opposite side (not wishing to clog up their own deck with a less than optimal card). Or maybe matching your bid was all they could manage based on their current cards and supply of influence cubes. Or maybe they’re trying to deceive you. Make like Sherlock and use your skills of deduction. Permanent Effect cards. If you claim any card with that green symbol shown above, you draw a random ‘Sanity’ counter (from a distribution of 12 ‘Mad’, 6 ‘Sane’). Same happens whenever you assassinate/hide royalty. Get a total of 3 Mad counters, you go insane and reveal your identity; Loyalists carry on as normal, albeit now a known quantity, but Restorationists die, causing the game to end. One of my favourite things in this regard, happens if the ‘Change of Heart’ Permanent Effect card appears. If a player claims this, they switch allegiance, which can result in all sorts of confusion, shenanigans and upsets. Multiple players might bid for it, maybe keeping a cube on there for the whole game and watching others carefully assess how that might affect the scores turn-to-turn, based on whether they or someone else intend on claiming it. You could even go back and forth with your actions, keeping players guessing when they thought they had it figured out. Assassinating a member of the royalty will only score points for Restorationists, but a Loyalist could choose to assassinate one just to throw others off their scent. Or simply to stop a Restorationist earning those points instead. I’m probably making the game sound more complicated than it really is, but once learned, the actual gameplay is really rather simple: you have two actions per turn, based on whatever the cards in your hand enable you to perform. The rest is reacting to other players actions and what you know/suspect of their identities, finding ways to improve your available deck of cards while manoeuvring towards an ultimate victory by some means. 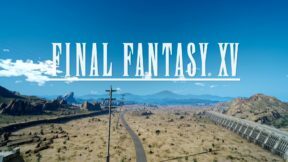 It’s a delightfully chaotic, open-ended yet supremely tactical and varied experience that never plays the same way twice from game to game and group to group. And it’s a game you’ll definitely want to replay a fair bit. Firstly, because it will take some time to appreciate all the game’s mechanics and various nuances, but also because not all the game’s cards will make it into a playthrough. There are 60 game cards, with nearly all of them unique, yet only a maximum of 48 will make it into the game (4 cards per city in games of four/five players) and, of those, 12 start face-up with the rest only revealed based on what players claim. This means that certain really powerful cards of which there is only one copy each, such as Zombies and Vampires, might not show up at all; either through complete absence from the game or buried deep within a stack that is receiving no attention. While it might be disappointing that there isn’t always a guarantee of zombies, vampires and other supernatural elements, I find that makes them all the more memorable when they do make an appearance. In addition to that, are 12 ‘Permanent Effect’ cards (the aforementioned ‘Change of Heart’ being one) which sit off to the side of the board and don’t become part of a player’s deck when claimed. They offer all sorts of weird and wonderful effects as well, and because just two are revealed during setup and more added only when a city box (the 3-4 card stacks) runs dry, rarely have I seen more than four come out in a single game. These offer even further wrinkles and tactical opportunities for savvy players and can prove game-changing (and highly entertaining) in certain circumstances. Top row featuring William Morris (Bernard Hill) and Sergei Kravchinsky (Orson Welles). Bottom row featuring: Vladimir Burtsev (Christopher Lee) and Sergei Nechaev (Sam Rockwell). Oh, and Double Agents. Let’s not forget those. See, if all the tension, intrigue, and deception from other players wasn’t enough, a player cannot even be sure that their own agents truly work for them. For all of the 22 recruitable agents there is a corresponding Double Agent counter, with these being dealt out to players during setup. Four/five players receive two each; Three players receive three each; Two players receive four each. These are not governed by what agents will actually appear in the game (due to that random card distribution), so players could wind up with complete duds. However, that’s not to say that a player can’t bluff about what they have, or mislead others. I’ve had a game where only one player completely forewent bidding for a particularly powerful agent, remaining silent and sporting a smirk on his face. After some cautious glances around the table, we all took it to mean he owned their Double Agent token and promptly left them alone. Only later did we discover the deception. The blighter! Why the concern? 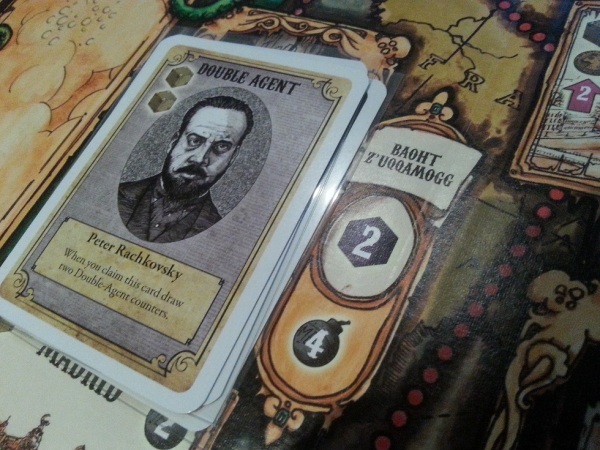 Well, if someone else is in possession of the agent, a player can reveal the corresponding Double Agent token as an action during their own turn, claiming that agent for themselves, which means their original owner effectively wasted those earlier actions bidding and claiming them. Alternatively, the person with the Double Agent token can reveal it when the other player attempts an assassination using that agent (triggering it and/or contributing bomb points), which sabotages the whole thing. This both allows them to claim the agent out-of-turn and causes the would-be-assassin to waste cards in addition to their earlier efforts. Whether or not, or when, a player chooses to reveal a Double Agent token will come down to the circumstances and opportunities. Claim the agent as your first action then move them to block a bid? Maybe claim an agent that someone thought they were using as a tiebreaker in a bid against you? If you claim that agent, will it leave the original owner’s Main Agent, who you suspect is a Restorationist, wide open for assassination by another player? All sorts of tactical decisions to be made should the stars align and you find someone else in possession of an agent for whom you own the Double Agent counter. It blends in perfectly with the theme and adds another layer on top of a tense, atmosphere fraught with deception and betrayal. It’s also highly amusing watching people’s faces when it happens. Possible variant: you must first pronounce the name of the royal ‘person’ you intend to assassinate. Also pictured: Peter Rachkovsky (Paul Giamatti). If I’ve overwhelmed you with information at this point, I’m not surprised. Therein lies the biggest issue with the game: it is very hard to teach. There is so much going on mechanically, even on the metagame level, that not everything will be grasped naturally or intuitively after a couple of plays. The rulebook does a decent enough job explaining the game, even containing a card-by-card explanation for the trickier to grasp ones, but it doesn’t quite cover some instances you might encounter or important questions you might have. The scoring of points for some elements can be a little confusing during the first game, too, as both sides will score points for certain asymmetrical actions only to lose them if they don’t actually belong to that faction (e.g. Loyalists score points for assassinations, but will lose them when their identity becomes known either mid-game or during the end-of-game resolution). Fortunately, the designer has answered many questions in the Rules section on the game’s BoardGameGeek page, which has been formed into a player-collated FAQ. On the Files section there, you’ll also find other useful resources. Alternatively, simply field your own queries to the many helpful and friendly users and fans of the game on the forums there; plenty have become quite knowledgable on the game and able to provide answers themselves. A further obstacle is that the ‘hidden identity’ aspect means it’s very hard for players to ask questions during gameplay without revealing their own allegiance. Plus, teaching the game by simply telling everyone to refer to the player aids isn’t the politest or most helpful solution. In fact, when a card’s text offers little illumination about how its featured action works, even the player aids themselves don’t contain quite all the pertinent information and, therefore, many occasions arise where the rulebook has to be checked as well. The other potential downside is that much relies on the players understanding all the rules, possibilities and playing optimally. If someone’s careless about revealing their allegiance or just hasn’t cottoned on to other factors, that can make it easy for the opposite side to seize an advantage and force players of the same allegiance to try and mitigate this. Fortunately, the metagame aspect allows players to somewhat self-balance this by how they react to the knowledge so it’s somewhat minor and can actually be a fun part of the dynamic. The major and potentially persistent problem is when people treat it like a team game, because that really does break it. Players need to understand that just because someone shares an allegiance with them, there can only be one winner. Players should by all means, try and help their side to ensure none of them finish in last place, but shouldn’t effectively hand the game to someone else if they can help it. This is a battle for control of the world; there is no playing nice. So, yes, it is tough to teach to new players, but it’s definitely worth the effort. I find a real joy watching everything gradually come together in players’ heads and the moment when it finally clicks and they realise how to win the game or at least cause some major upsets. Sure, the geography’s a little distorted, but this is art. Alternatively: the tentacles did it. The other potentially off-putting factor is the look of the game. Personally, I love it. The board might appear a bit cluttered but all the vital information’s there, and it looks great with the variety of coloured player cubes and discs across it. From the peculiar agent portraits to the weirder illustrations and sepia-toned sketchbook-style city cards, the game oozes character. And that’s it in a nutshell. No blandness. The game is full of character, with its theme, its innovative blend of mechanics, its idiosyncrasies and its chaotic nature. If you hit it off, it’s the sort of game where you’ll replay the latest session over in your head, thinking back to how a slightly different move here or there would’ve changed everything. You’ll be eager to dive back into its tangled web to learn every strand or to appreciate the machinery of it, pulling all the levers and prodding all the buttons. You’ll feel like both a Spymaster, managing your network of resources, daring others to blink first, and a General, commanding soldiers across the global battlefield, spilling blood in the name of victory. As for the theme, you’ll relive the stories it creates. Like the time Emma Goldman planned on assassinating He Who Resides in the New World only to be chased off by a pack of zombies, when Sherlock and Irene Adler tussled for control of London, when Agent Thursday killed Agent Monday, mistaken in his suspicion as to which side he was on, when Agent Tuesday and Friday spent so long on their vendetta that they lost sight of the bigger picture, or when the Society of Leopold suddenly emerged to wipe out Agent Thursday’s vampiric agents, or when Cthulhu destroyed Rome, or when… It’s these unique and often bizarre moments that provide their own entertainment and leave the strongest impression, easing the tension a little and earning the greatest laughs. It’s a game that pleases with both its intriguing theme and mechanics, offering a great deal of replayability. So, if you’re willing to invest the time in learning the game and teaching others, it’s a rewarding experience that should have you all coming back time and time again. I highly recommend seeking out a copy.